When does true love give in? When does true love push back? 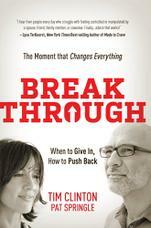 Break Through by Dr. Tim Clinton and Pat Springle shows you how to love and how to set effective limits so that everybody wins. While most of our relationships may be healthy and satisfying, we often have one or two important people who change the rules and drive us crazy--a deadbeat dad, an alcoholic spouse, a wayward child, a demanding boss, a lazy roommate. When you really care about someone, it's easy to get stuck in painful, even destructive patterns--caving in to a spouse's manipulation, ignoring a live-at-home son's irresponsibility, not confronting a friend's addiction. We excuse people again and again, and then kick ourselves for not setting better boundaries. When we act out of enmeshment and codependency, we may think we are experiencing love, but it's a shallow substitute for the love God longs for us to share and enjoy. 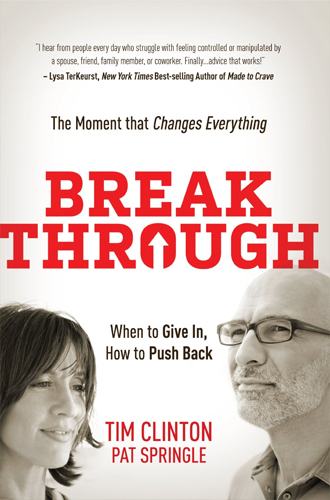 Break Through helps you exchange manipulative and unhealthy relationships for reciprocal relationships that honor boundaries and allow each person the freedom to take responsibility for his or her own choices. This important book, with its transformational tools and insightful illustrations from leading Christian counselor Tim Clinton and noted author Pat Springle, will guide you in not only breaking through to better relationships but making big changes for the better. With proven principles for learning to say yes when you want to and no when you need to, you'll discover how to give up your need to please, rescue, fix, or control anyone else. Leave others' unrealistic expectations behind. Speak the hard truth to those who have hurt you. And exchange harmful relationship habits for healthy ones. Like a GPS that guides you through the detours in your travels, Break Through offers sure navigation across the landscape of troubled relationships, giving you a saner perspective, along with practical steps and valuable tools that can protect you from the controlling, irresponsible behaviors of others. And the study questions, checklists, and inspirational stories in this book will help you fulfill your deepest potential for connecting to others in authentic ways. Within these pages is your moment: the moment when you break through to the love that God longs for you to experience with the people who matter most!